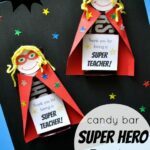 Since the school year is almost over you might be starting to think about fun teacher appreciation gifts to give to your child’s teacher to say thank you for a great year. 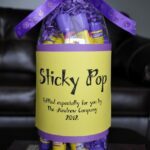 I was looking at some fun yellow party favor bags in my craft closet and decided they would be perfect for holding candy or a gift card for a teacher gift. 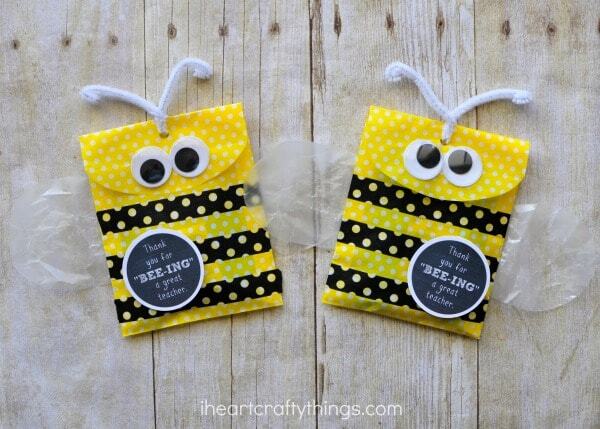 For a special twist, we turned them into a cute bee DIY teacher gift bag that is super simple to make and is just perfect for a simple candy gift or a gift card. 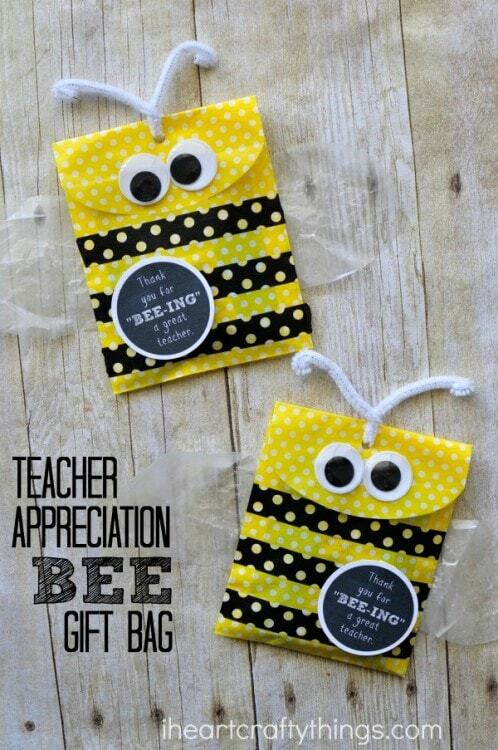 I’ve also including a printable label that reads Thank you for “BEE-ING “a great teacher to complete this adorable teacher gift. 1. Start by adding lines of black washi tape down your yellow party favor bag. Then cut out bee wings from your wax paper and glue them onto the back of your bag. 2. Fold your treat bag down to close it shut, making a bee face. Glue your googly eyes onto the bottom of the folded flap. Punch a hole at the top of the folded flap with your hole punch. 3. Now open back up your gift bag and fill it with candy or a gift card. I love how these bags are the perfect fit for a gift card. We chose to fill ours with a few Ghirardelli chocolate squares and a gift card. 4. Cut your white pipe cleaner in half. Fold the top of your gift bag back down and insert the pipe cleaner into the hole at the of your treat bag. Bend it in half and twist it closed a few times to close the bag. Bend the ends of the pipe cleaner inward so they aren’t pokey and you are left with two antennae. 5. 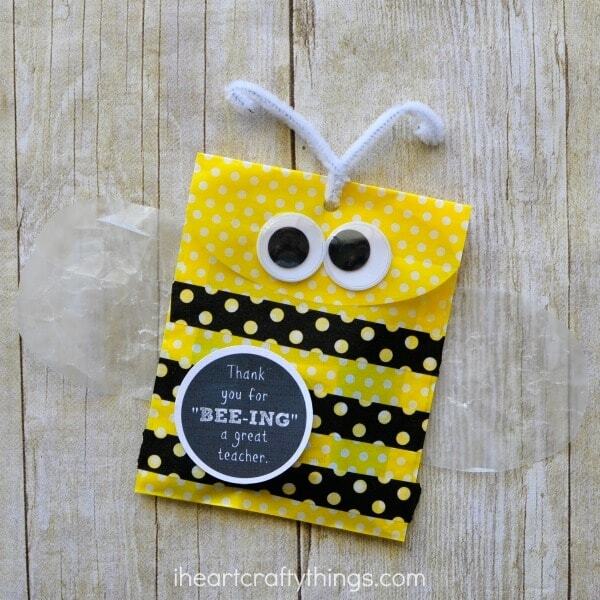 Print off the Bee Gift Bag Label and cut out a label. 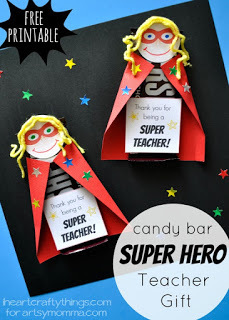 Tape or glue it onto the teacher gift bag. 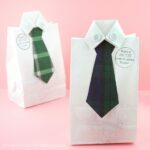 Now your cute bee DIY teacher gift bag is all ready to give to your teacher. I bet it will brighten their day!